Not a member, but interested in learning more about the Competency Framework? Take a closer look at the framework with this short preview. 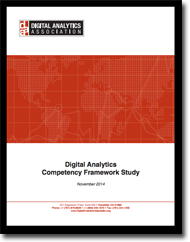 The Digital Analyst Competency Framework is the first-of-its-kind industry reference. The Framework defines the skills, knowledge and abilities necessary to succeed in the field of digital analytics. The Competency Framework spans three experience levels (Entry-Level, Mid-Level and Senior) across two professional tracks (Analytical and Technical). The Framework can be used by digital analysts, their employers, HR professionals, and educators. Want to learn more? See our FAQs. The Competency Framework is designed to benefit professionals, organizations and the industry as a whole. Professionals: Identify your competencies and plan your career path. Organizations: Assess applicants against a standardized set of competencies. Self-Assessment: Helps digital analysts explore career roles they desire, discover the skills they need to function effectively in each role, and identify the resources available to build those skills. Job Descriptions: Provide 15 job descriptions across 4 levels of the profession, from entry-level to executive, enabling digital analysts and hiring managers to define job roles and identify options for career paths. Not a DAA member but interested in trying our resources? Set up your non-member Web Account before downloading your free sample. Document: Download this FREE sample of the framework now!